BAE Systems is set to equip the Drop 2 upgrade package on the UK Royal Air Force’s (RAF) entire Tranche 1 Eurofighter Typhoon multirole combat aircraft fleet. The move follows the successful delivery and test flight of a Drop 2 package equipped Tranche 1 Typhoon fighter at RAF Coningsby in Lincolnshire, UK, in May 2012. The aircraft was also validated by the 17(R) Test and Evaluation Squadron, as part of the High Rider trials activity later that year, and is currently participating in the Red Flag 2013 air-to-air combat exercise at Nellis Air Force Base in Nevada, US. MOD Defence Equipment and Support Fast Air Support Team drops desk officer Robert Forshaw said the Drop 2 upgrade is scheduled to be installed on the remaining frontline squadrons shortly after the completion of the exercise. "The move follows the successful delivery and test flight of a Drop 2 package equipped Tranche 1 Typhoon fighter." "The participating nations within the Drop programme have taken a keen interest in what the Royal Air Force has achieved with this modification and are now looking to embody the Drop 2 product onto their Tranche 1 aircraft," Forshaw added. NETMA Contract Engineering Services head Andy Flynn said the Drop 2 product is a result of the feedback obtained directly from pilots. "We are also on a journey that will lead to availability improvements that will deliver cost benefits too," Flynn said. Developed by BAE’s Capability Sustainment Team, the upgrade package is designed to provide capability enhancements to the aircraft’s avionic systems, such as displays and controls, attack and identification, defensive aids and communication sub systems, simultaneously offering availability and sustainability improvements to the fleet. As part of a mutual support agreement between the UK and Germany, the package is jointly developed by BAE, German National Support Centre (SUZ) organisation and QinetiQ. Typhoon is a twin-engine, canard-delta wing, multirole fighter designed for deployment during air policing, peace support and high intensity conflicts. 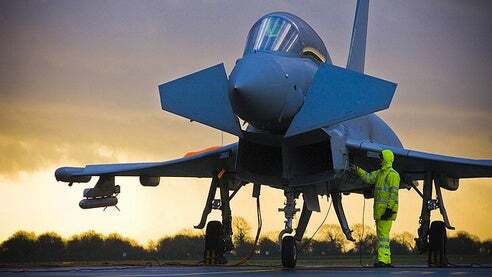 Image: The Royal Air Force’s Typhoon. Photo courtesy of BAE Systems.